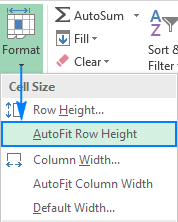 The tutorial shows different ways to change row height and resize cells in Excel. By default, all rows on a new workbook have the same height. However, Microsoft Excel allows you to resize rows in different ways such as changing row height by using the mouse, auto fitting rows and wrapping text. Further on in this tutorial, you will find full details on all these techniques. 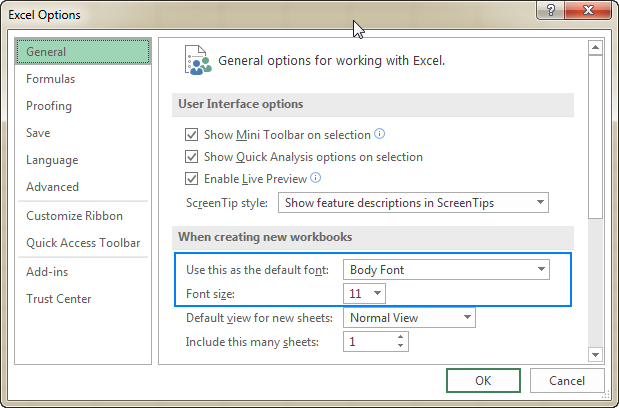 In Excel worksheets, the default row height is determined by the font size. 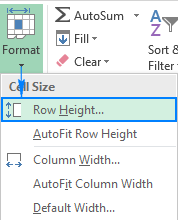 As you increase or decrease the font size for a specific row(s), Excel automatically makes the row taller or shorter. According to Microsoft, with the default font Calibri 11, the row height is 12.75 points, which is approximately 1/6 inch or 0.4 cm. In practice, in the latest versions of Excel 2016 and Excel 2013, row height varies depending on the display scaling (DPI) from 15 points on a 100% dpi to 14.3 points on a 200% dpi. You can also set a row height in Excel manually, from 0 to 409 points, with 1 point equal to approximately 1/72 inch or 0.035 cm. A hidden row has zero (0) height. To change the height of one row, drag the lower boundary of the row heading until the row is set to the desired height. To change the height of multiple row, select the rows of interest and drag the boundary below any row heading in the selection. To change height of all rows on the sheet, select the entire sheet by pressing Ctrl + A or clicking the Select All button , and then drag the row separator between any row headings. On the Home tab, in the Cells group, click Format > Row Height. In the Row height box, type the desired value, and click OK to save the change. Tip. To make all rows on the sheet the same size, either press Crtl+A or click the Select All button to select the entire sheet, and then perform the above steps to set row height. When copying data into Excel sheets, there are times when a row height does not adjust automatically. As the result, multi-line or unusually tall text is clipped like shown on the right-hand part of the screenshot below. To fix this, apply the Excel AutoFit feature that will force the row to expand automatically to accommodate the largest value in that row. Tip. To auto fit all rows on the sheet, press Ctrl + A or click the Select All button, and then either double click the boundary between any two row headings or click Format > AutoFit Row Height on the ribbon. Go to the View tab > Workbook Views group and click the Page Layout button. This will display the rulers showing the column width and row height in the default measurement unit: inches, centimeters or millimeters. Tip. 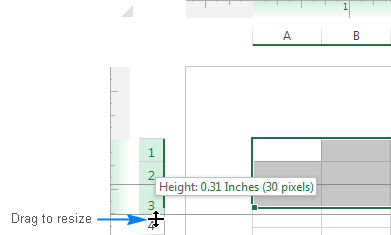 To change the default measurement unit on the ruler, click File > Options > Advanced, scroll down to the Display section, select the unit you want (inches, centimeters or millimeters) from the Ruler Units drop-down list, and click OK.
As you have just seen, changing row height in Excel is easy and straightforward. The following tips might help you resize cells in Excel even more efficiently. Alternatively, to make all cells the same size, press Ctrl + A and drag rows and columns to a desired pixel size (as you drag and resize, Excel will display the row height and column width in points / units and pixels). Please keep in mind that this method can only show square cells on the screen, however, it does not guarantee a square grid when printed. 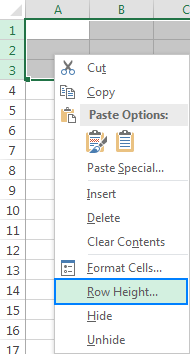 If you are not quite happy with the optimal row height set by Excel for your newly established default font, you can select the entire sheet, and change row height numerically or by using the mouse. After that, save an empty workbook with your custom row height as an Excel template and base new workbooks on that template. This is how you can change row height in Excel. I thank you for reading and hope to see you on our blog next week! 14 Responses to "How to change and AutoFit row height in Excel"
Thank you for your kind words, Zeeshan! It's a pleasure to share my findings and a joy to hear that my work is helpful. Oh, Svetlana,it is pretty good. I check everyday this site for new post, when found its being pleasure for me.Thanks for ur selfless effort. Question: is it possible to setup row/column height in pixel?& how? You can setup the row height /column width in pixels by dragging the boundary of the row/column heading. As you do this, Excel will display the row height both in points and pixels (please see the very first screenshot in this tutorial). If you want to resize multiple or all rows/columns at a time, select them, and then drag any heading boundary in the selection. Yeh,I know what have u described.But I was actually want to know, is it possible to setup row/column height in fractional pixel. Suppose, 1.3 pixel? Meaning, you can only change the row height in increments of 0.75 points. For more details, please see the above link. Thank's Svetlana,for your cooperation.may God bless you. Thank you for your feedback, Rohan! I am delighted to hear that our articles are helpful. Thank you for sharing the handy stuff. I have Excel 2016. Autofit for Row Height is not working. Whether I double-click to adjust to auto, or use the drop-down for formatting, neither works. There are no merged cells in my row. I am baffled. Are there merged cells in the row? Merged cells won't auto size. Are you at 100% zoom? If not, go to 100% and see if that works. If it does you should be able to go back to the other zoom level and the fix will stay. Try Auto sizing the column. That sometimes works. I have a sheet with a dozen columns (various widths) and over 10,000 rows which were originally autofitted as to height. Something happened the other day (I probably pressed or clicked something by mistake), and immediately all rows and columns "autofitted" to exactly DOUBLE their automatic height and width! It was easy enough to manually adjust the column widths back to normal, but I have still been unable to restore the autofit height of 10,000+ rows. One cell in each row has a varying number of lines of wrapped text (Calibri 10), so this usually determines the overall height of the particular row. So if such a cell has (say) 10 lines of text, then the cell will also contain 10 blank lines. I can manually adjust any individual row height back to normal, but then it won't expand or contract with changes in the text. AND, if I do another autofit after a manual height adjustment, the height goes right back to double! Only this one sheet in the workbook is affected. If I copy the contents of the sheet to another sheet and then autofit the height, it seems to adjust normally. Ultimately, this may be what I have to do (make a copy and then autofit the height). However, I will not know: 1) what I did to cause this problem, hence 2) how can I avoid causing the same problem again, and 3) how to fix it if I do (without having to make copies of the sheet). Keep in mind that BOTH row and column sizes doubled at the same time. Column width was not a major problem (just an annoyance) as the columns were manually adjusted in the first place and there are only twelve to be re-adjusted. Have you seen this problem before, or can you suggest a cause or solution?